Present state: Demolished no evidence of the halt remains. A new house stands on the site of the halt. 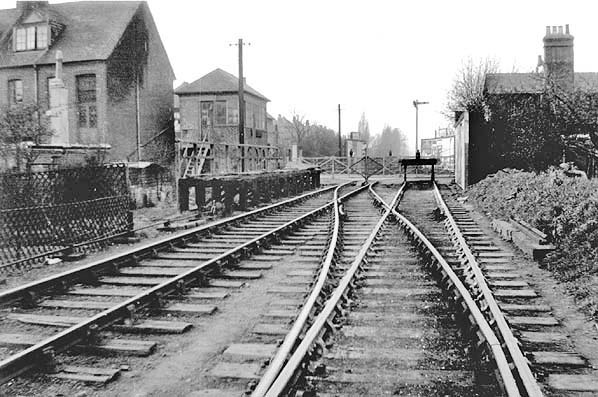 The junction at Acton faced away from London and this presented a problem for North London Railway trains running between their City terminus at Fenchurch Street and Kew. To overcome this, the NLR attached a brake coach to the rear of their Kew bound trains, this was detached at the junction allowing the N & SWJR's locomotive to back onto the line and take the coach on to Hammersmith. This procedure wasn't ideal and there were several derailments as the coach was sometimes released without the train coming to a stop; this was an illegal practice. On its return from Hammersmith, the coach would then be recoupled to the returning Fenchurch Street train. The journey time from Hammersmith into central London took an hour and did not prove popular with commuters. quicker and more convenient route into London which brought a drop in passengers to a line that was already running at a loss. The 'through working' stopped in 1865 when an hourly shuttle was introduced between Acton (Acton Central from 1925) and Hammersmith. The H&C brought growth to Hammersmith and to cater for this the London & South Western railway opened a line from Kensington to Richmond in 1869 with a station at Grove Road adjacent to the H&C's Hammersmith Station. Both these stations were more conveniently sited than the N & SWJR's Hammersmith Station which was a mile from the town centre. In 1874 the Metropolitan District Railway extended their line into a new terminus at Hammersmith as well. The branch remained open for goods with a daily freight train which continued to operate into the 1960's. 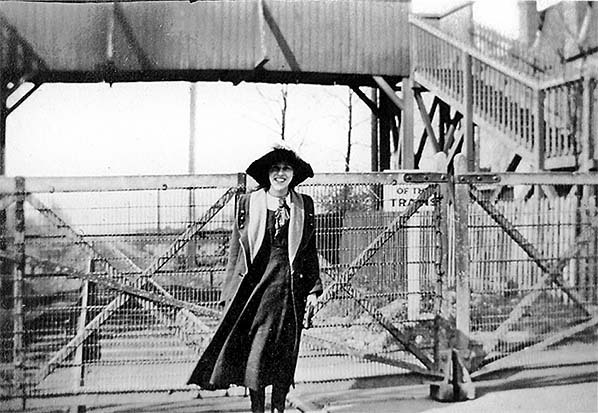 The Acton Coal Depot and an asphalt plant close to the junction also continued to be served. There were occasional passenger excursions like an RCTS railtour on 10th November 1956. The Acton coal depot closed on 4th January 1965 and freight service to Hammersmith & Chiswick was withdrawn on 3rd May 1965. 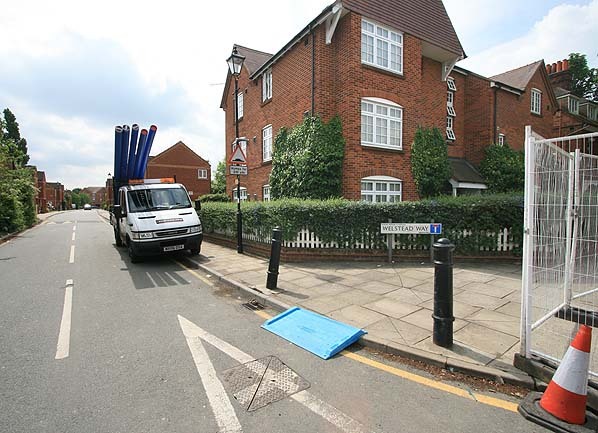 The track was lifted shortly afterwards. Sources: London Railway Record No. 8 July 1996 and No. 9 October 1996 published by Connor & Butler, Railway Magazine No 441 March 1934 and Railway World August 1961. Looking north from Bath Road c1912. The halt was on the south siode of the crosing. 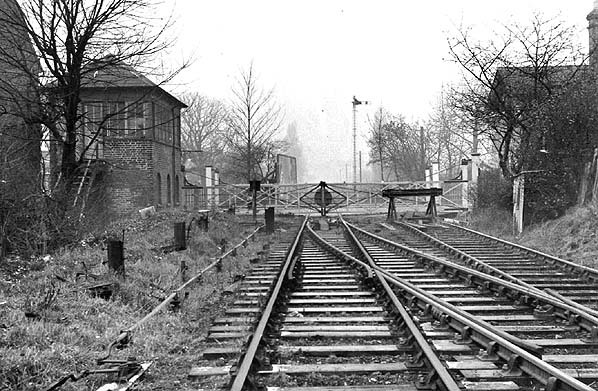 Looking north at the site of Bath Road Halt in February 1956. Some timber supports for the platform are still in place. 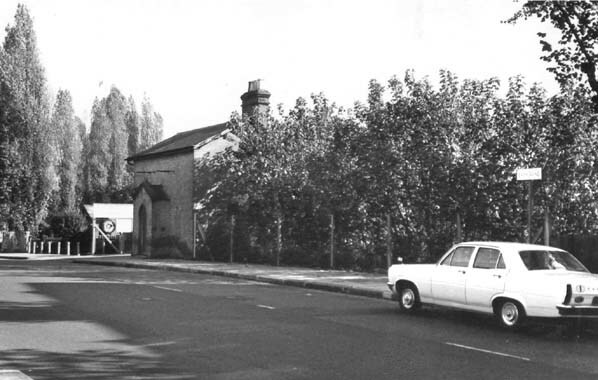 The site of Bath Road level crossing in 1971. The site of the halt is obscured by trees. The crossing keeper's cottage is still extant at this date.